Carpal Tunnel Syndrome: Why Braces? For those of you who have had carpal tunnel syndrome (CTS), you probably know all about braces. These are devices worn on the wrist that stop you from bending the wrist up or down. They may be worn anytime of the day if they don’t interfere too much with one’s current activity but are especially worn at night. One might think it would be more important to wear these during day when we are active and moving our fingers and hands a lot as we go about our normal work or play activities—not at night when we’re basically just laying there doing nothing but sleeping, right? Wrong! It’s more important to wear these at night. This is because we cannot control our hand/wrist position at night as we tend to curl up in a ball when we sleep and the wrist gets cocked up or down, often to the end point of the range. So, why is this so bad? To answer that question, let’s look at the chart below on the left. The chart (above left) shows a cross section of the carpal tunnel. This illustrates the many structures that are inside the tunnel making it very compact or tight. Notice the small white circles in the middle of the tunnel. Those are the tendons that pass through the tunnel. There are nine of those and they attach the muscles in our forearms (on the palm side) so our fingers so we can shake someone’s hand or carry a suitcase (grip). Just to the left of center, on top of all the tendons sits the median nerve, which is just below the “roof” of the tunnel (the transverse carpal ligament). Now, normally, the pressure inside the carpal tunnel will approximately double when we bend our wrist, putting more pressure on the nerve and pushing it into the roof (ligament), which creates the numbness and/or weakness in our grip. But in the CTS sufferer, there is already more pressure in the tunnel due to the swollen tendons so when the wrist is flexed or extended, the pressure goes up much more the twice— more like six times more pressure—hence, more symptoms. So, if we’re sleeping with our wrist bent either way, the pressure pushing the nerve against the roof is a lot more than normal (up to 6x more)! 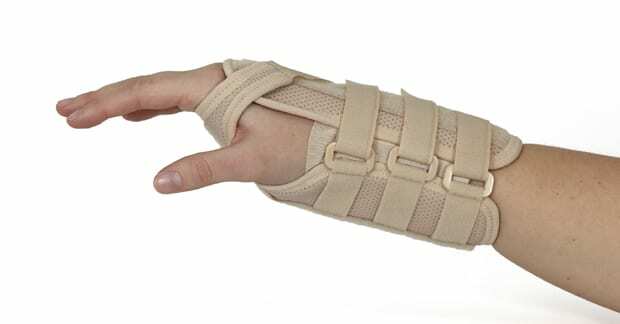 Now, can you see the reason for the “night splint?” It is VERY effective in keeping the wrist straight or “in a neutral position,” which is needed to allow the nerve to NOT be pinched so it can heal. Regarding braces, there are MANY different kinds of braces available and deciding which one to use is no easy task, not to mention the fact that they come in different sizes! When you are treated for CTS, your doctor of chiropractic will fit you with the proper size brace, if it’s necessary.